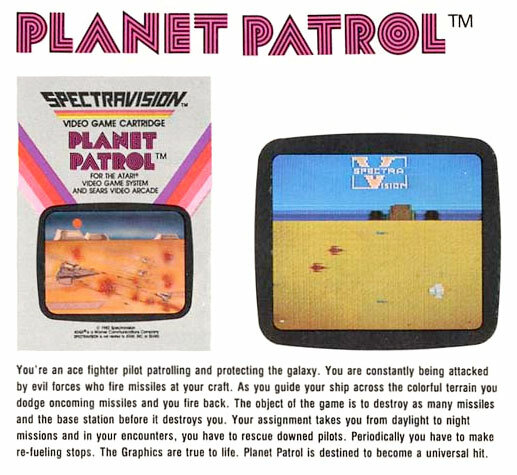 Side scrolling space shooters were not uncommon in this era, so it seems likely that Planet Patrol was seeking to capitalize on this genre and include a few extras. 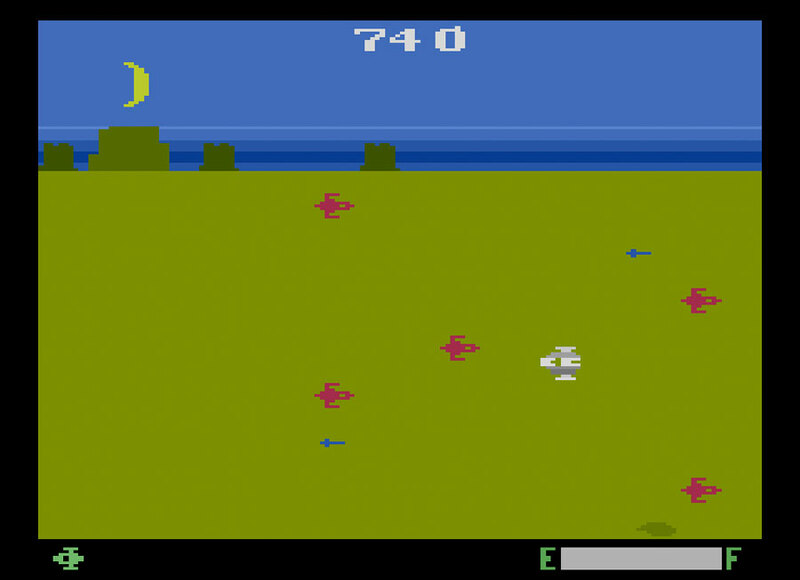 Defender was a leader in this genre, but the 1981 Atari 2600 version had a lot flicker issues. It wasn't until 1985 that Defender II came out for the 2600 with a vastly better experience. In between, Planet Patrol tried to enhance the experience with a refueling scenario and day/night scenes. You have been tasked to patrol your planet around the clock by day and night. As you navigate your ship you have to dodge enemy fire and destroy their spaceships. It is necessary to refuel occasionally or your mission may be cut short. As the sun sets and the night creeps in, your mission becomes much more difficult. Originally founded in 1981 as SpectraVision, a name change to Spectravideo was in order to avoid legal issues with OnCommand's Hotel TV system, also called SpectraVision. 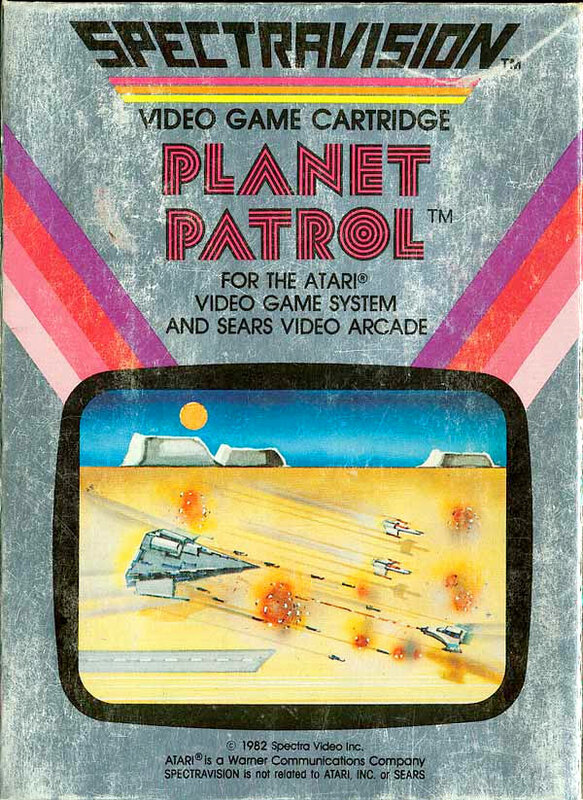 They began as a video game company that predominantly made Atari 2600 games as they moved into making computers. This is a 1 or 2 player game with "fast" and "slow" game variations available via the Game Select Switch. It begins quite innocently and seems simple enough, but the action will increase. Enemies shoot heat seeking missiles and torpedoes at you. Most targets can be shot down, but the smaller torpedoes must be dodged, as they are indestructible. To gain additional points you can rescue downed-pilots, but be careful as you can accidentally shoot them. Large missile bases appear and must be destroyed. The final one explodes and fills the screen with debris that must be avoided - no shooting your way out of this mess. When you see the long black landing strip, you know you're in the home stretch if you can line up with it and land. With a successful landing comes a needed refueling and you're off to the next level where you'll encounter a similar adventure with a bit more speed and enemy presence. Is a side scrolling shooter in which you destroy enemy ships, rescue downed pilots and destroy missile bases. Oh yeah, don't run out of fuel. It's not an outstanding game, but it offers some action and a few diversions to make it a bit different from others. We'd still rather play Defender, but this is a fun enough romp.